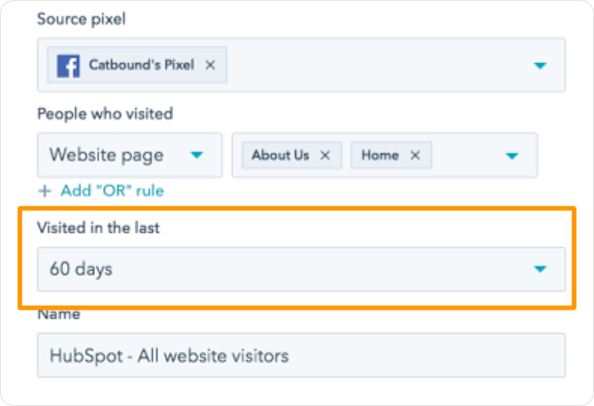 Last month, we let you get more granular with website audiences in the ads add-on by adding the ability to create audiences based on URL rules. Now, we've expanded on this feature in several different ways so you can get more granular with your targeting. First, you can now target your ads based on interactions with specific content, such as a blog post. You can also create a website audience within a flexible time period to customize your targeting based on how recent a website interaction was. Finally, you can now combine multiple rules using ‘OR’ logic. All of these audiences can be created simultaneously across all advertising accounts and networks you have connected to HubSpot. Website audiences allow you to retarget visitors to your site based on information you’ve gathered from their activity, allowing you to customize your ads based on their interests, their stage in the buyer’s journey, and the recency of their interactions. For example, if you have a set of blogs and landing pages all related to a similar topic, you can create an audience of anyone who has viewed any of those pages and retarget them with ads related to that topic. You can also, for example, create separate audiences of 1) visitors to your website within the last week and 2) visitors to your website within the last quarter. The more recent visitors are more likely to remember your brand and may be worth more to you, so you can adjust your content and your bidding strategy accordingly. Within the ads tool, go to ‘Create audience’ and create a ‘Website visitors’ audience. Select your source pixel based on the specific account and advertising platform for which you wish to create the audience, and then choose which pages’ traffic you will target. When creating an audience off of traffic to a specific page, you now have a number of different options. You can create an audience of visitors to specific website pages, landing pages, or blog posts. You can still use ‘URL contains’ rules and you can now also use ‘URL equals’. You can also include ‘OR’ rules to expand your audience. You could use this to target anyone who has visited your pricing page, or has visited your contact us page, for example. Finally, you can now also edit the acceptable time frame within which a visit happened in order for that site visitor to be included in your audience. If someone visited your pricing page for example, you might want to create an audience of anyone who visited that page within the last 7 days. For visitors to your blog, it might be better to have a longer time frame for inclusion in your audience. This is now live for all users of the ads add-on.